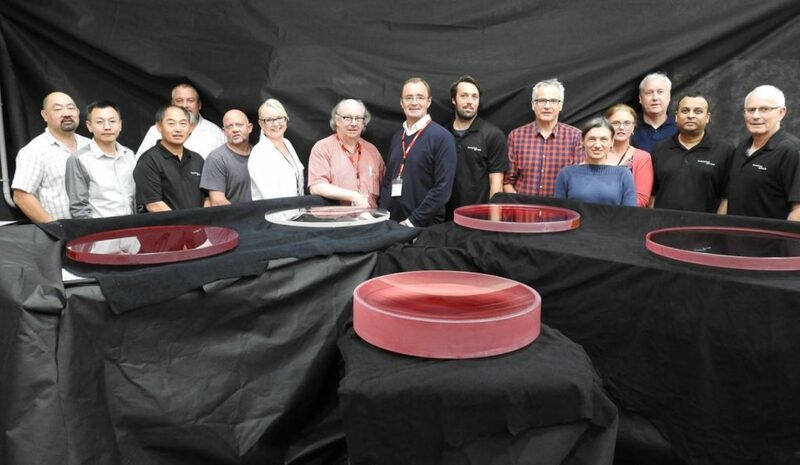 Sam Barden reports that previous to the application of an anti-reflection coating an inspection and review of the five smaller (650 mm diameter) lenses of the Wide Field Corrector (WFC) was held last week at KiwiStar Optics. They are shown below. The purple colour is due to a protective layer of photo-resist applied to protect the lens surfaces. The clear lens (L4) was undergoing final measurements, so it is uncoated. On the left is Malcolm Young (the project manager), next to him is Jin Zhang (mechanical engineer). To the right of Joar Brynnel is Abe (one of the optical techs), Graeme Jonas (optics expert), Dijana Bogunovic (Optical Engineer with the unenviable job of stitching the test data together), Sandra Ramsay (KSO upper management), and Dave Cochrane (technical leader) to the far right. The L4 test data are still being reviewed, but the go-ahead to have all of the lenses shipped to Quantum Coating in the USA to receive their anti-reflecting coating is expected by the end of the week. The largest WFC lens, L1, is already in the USA for aspherisation. Due to the time it takes to do the aspherisation, L1 will actually be the last one to be coated, but all should be finished by the end of this year.